Sichuan province is next to Tibet Autonomous Region. So, you can see Tibetan ethnic groups in the area of Ganzi and Aba. But there is still a little difference between Tibetan in Sichuan and Tibet. Thus, we offer some tour groups to Sichuan, tourists can find out the features of these two by themselves. Besides, as the land of abundance, there are many worth-visiting places in Sichuan. Let's say there are four parts of tourist elements in Sichuan. At first, is the marvelous landscape of course. 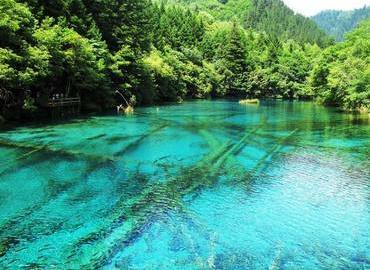 Amazing Jiuzhaigou, Huanglong National Park, Mt. 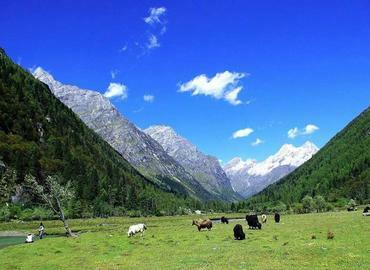 Siguniang, Daocheng Yading-the last Shangri-La…all of these can let you know what is the heaven on earth. Secondly, religious holy place. Mt. 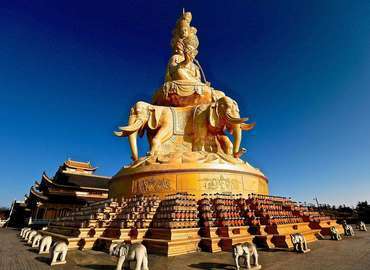 Emei, one of the four Buddhist holy mountains in China; Leshan Giant Buddha, the largest stone carving Buddha in China, both entered the list of World Cultural and Natural Heritage. Thirdly, Giant Panda Base. There is no doubt that all people on the planet love this lovely animal. So why not come to have the nearest contact with Panda in its hometown? 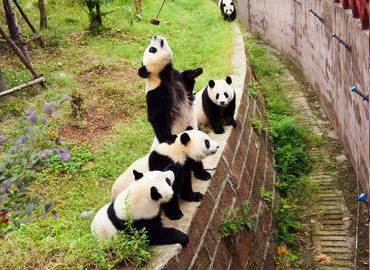 We bet it must be more interesting than watching in the crowded Panda Museum from the distance. The last part is the culture and lifestyle. You can see the jaw-dropping face-changing folk performance and taste the spicy Sichuan cuisine. Or you can learn to play Mahjong to enjoy a real leisure life of Sichuan. All the above list will not disappoint you. So, let's get the party started! As one of the most beautiful travel routes in China, this tour will take you into a world of fantasy and show you the charming of Tibetan culture. 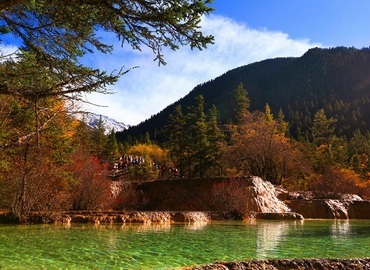 You can enjoy the dreamy, colorful pools and the grand snow mountains in Jiuzhaigou and Huanglong. Then take a walk in the ancient city of Songpan to get close to the old civilization. As one of the World Natural Heritage Sites, 4 Girls Mountain is a wonderful place where you can be inspired by its breath-taking views on a trek to the mountain top. The tour starts from Chengdu, and the tourists will experience a dreamful journey which including fantastic snow mountains, various of rare creatures and many scenery spots. This well-designed package is for those who are interested in religious culture as well as natural beauty. You can watch the colorful lakes in the snow-covered mountains in Jiuzhaigou and take a sightseeing tour around the glamorous Huanglong. Then you will travel west to experience the unique Tibetan culture. Want to know what is the real world of a fairy tale? Join in this group tour, let us show you the most beautiful water in China! 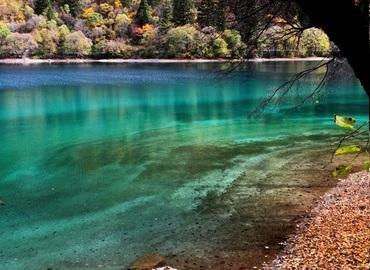 After this three-day journey, I bet you will never forget Jiuzhaigou and Huanglong National Park. Known as the Land of Abundance, Sichuan is a place full of beauty and legend. This classic travel route in the north of Sichuan will show you the picturesque landscape on the edge of the Tibetan Plateau and make you appreciate the unique cultures of the national minorities in southwest China. Today may be a memorable day of your life because you will see two giant treasures of China within one day. One is Giant Panda - what else you can describe it except for lovely; another is the Leshan Giant Buddha, the largest cliff-carved statue of Sakyamuni in China. This tour is a combination of China's national treasure and well-known Buddhist sites. You can enjoy the beauty of the lovely Panda, the biggest statue of Maitreya engraved on a cliff and one of the top four Buddhist mountains in China. After the two-day sightseeing, you will get back to Chengdu by taking a bullet train which runs at a speed up to 200 km per hour. What about the food in Sichuan? Sichuan is not only the home town of the pandas but also the paradise of gourmet. Sichuan cuisine, with its spicy and delicious taste, has crowned the reputation as “the food in China, the taste in Sichuan”. In Sichuan, you can't miss Hot pot, Double-cooked pork slices, Kung Pao Chicken, etc. It is very easy for travelers to find many street foods and snack vendors along the tourist streets in Chengdu such as Wide and Narrow Alley. With the spread of Western culture, many Western restaurants also can be found here. Chengdu is the capital city of Sichuan province. It is also a popular gateway city for travelers getting to Tibet. 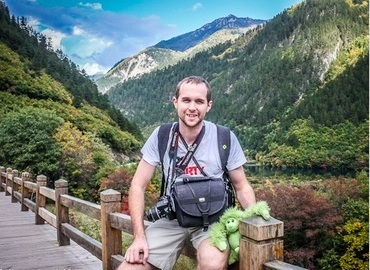 Most travelers will stay 1~2 days in Chengdu. We list the top 3 attractions for your reference. Chengdu Panda Breeding and Research Center: Chengdu is also called Panda City. In the Panda Breeding Center, you can experience nearly zero contact with lovely pandas. Wide and Narrow Alley and Jinli Street: These are two cultural and food streets. You could buy some exquisite handicrafts and enjoy traditional Sichuan food here. Wuhou Temple: Wuhou Temple is an ancestral temple in memory of an ancient Chinese Prime minister Zhuge Liang. Sichuan basin is in the southwest of China. It's surrounded by the Yunnan Plateau to the south, the Tibetan Plateau to the west and the Yangtze River to the east. In this basin area, you can hardly saw the sunshine since it's cloudy and foggy almost all year round. The weather and climate here is humid and mild. The best time to visit Sichuan is from April to October, during which the weather is not too cold or hot. If you have any questions, please feel free to consult our tour advisor.